So the Mozart Black, in it’s squat round dark glass bottle, touts that it’s made from 87% cacao mass right on the front label. It also instructs you to shake well before use. Does all that cacao settle out? Unfortunately, it doesn’t say what percentage of that mass is present in the bottle nor what else might have been compounded into it. Nothing artificial, I presume, since that would have to be listed on the label. All I can say is that it’s got a heady chocolate nose and a really nice chocolate flavor. Not horribly cloying. Most importantly, it garnered the approval of my “I’m not a big drinker, but I loves my chocolate” partner, Brandee. Stir well with with ice to chill and dilute. Garnish with the orange peel, cutting it over the cocktail to catch the oils. The Vya (from Quady, makers of Essencia) has a significant dollop of orange muscat in it, which complements the chocolate in the Mozart nicely. The Fee Bros. bitters bring a nice rounding cinnamon note into the mix. And, because I wanted even more orange I added a dash of orange bitters in this case Regan’s but you could also try Angostura. 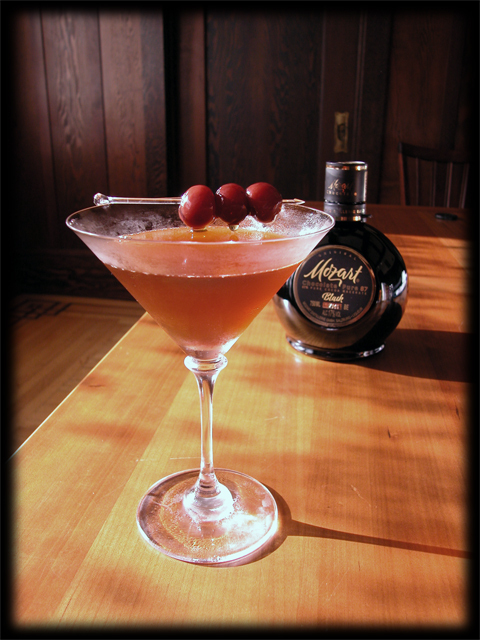 OK, there you have it: three variations on the Manhattan, each using the Mozart Black to a different effect. I’d deem this liqueur a worthwhile addition to any bar. The moment I came across a reference to chocolate bitters in Paul Clarke’s cocktail the Camerone something in me was hooked. It think it was the idea of a chocolate flavoring which didn’t turn your drink into something that “the girls” order at T.G.I.Friday’s. Spiritous chocolate in cocktails for adults. Right on! The bitters in question were of course Avery Glaser’s infamous Xocolatl Mole bitters. Right away I was like: “Who made these? Can I get some? Can I get the recipe?” I had no idea that I was starting to pull on a long thread that had been winding itself through the cocktail geek scene a good while before I arrived. Avery Glaser had been seeding bottles of these bitters (along with the Grapefruit) on the west coast for a while already. But most of these were empty (or locked away) by the time I became interested in them. Then I found the Bittermen’s web site where I learned about Avery Glaser’s struggle to obtain the permits and licenses necessary to make and sell the bitters legally in the US. (*). I got on Bittermen’s email list and joined Bittermens’s group at Google. Then late last spring when visiting NYC, I saw bottles, rather large one’s in fact, of the Xocolatl Mole bitters sitting on the shelves of most all of the watering spots I visited. At Mayahuel I even got to sample them for the first time (impression: cacao, musky cinnamon). The buzz was that something was going to happen – and very soon. And then it did. Avery Glaser brought Bittermen’s to Germany where it would be made by Stephan Berg at The Bitter Truth. Bottles have started to flow into the US, though I have yet to see one. Oddly, after all the wait and build-up, I found the price something of an issue: a single bottle is 21,16 € delivered or a bit over $30 USD (depending on the exchange rate). Ouch! I’ve decided to hold off trying them until some place local, like Cask in SF, starts carrying them and defrays some of the shipping costs through a bulk purchase. 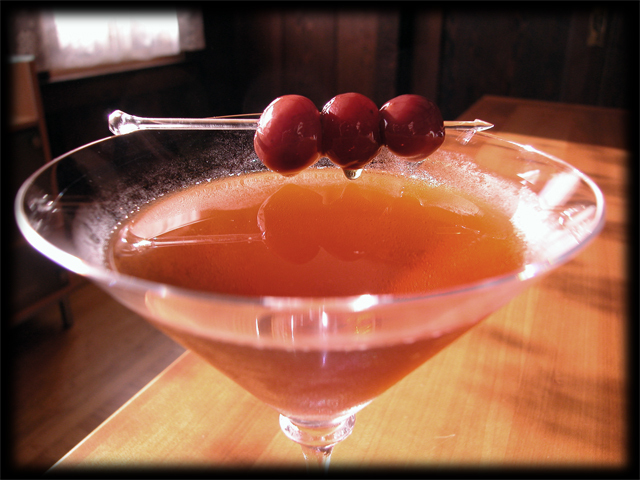 This entry was posted on August 27, 2009 at 6:36 pm and is filed under Cocktails, Manhattans with tags Bourbon and Rye, Cherries, Cocktails, Manhattans. You can follow any responses to this entry through the RSS 2.0 feed. You can leave a response, or trackback from your own site. Psst… If you haven’t seen the news, importing of the Bittermens (and all of The Bitter Truth’s bitters) has begun to the US through http://www.domaineselect.com – Store-shelf retail price should be $15, and instead of the standard 150ml bottle, they’ll be 200ml. We know in comparison to the other bitters out there, the Bittermens/The Bitter Truth is more expensive, but that’s less to do with cost of import and more to do with the cost and quality of the ingredients: we use no artificial flavors or colors, no glycerin or other chemical additives.